"This absolutely splendid book is a triumph on every level. A first-rate history of the United States, it is beautifully written, deeply researched, and filled with entertaining stories. 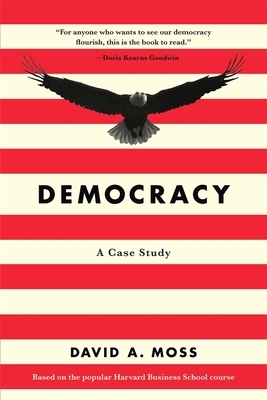 For anyone who wants to see our democracy flourish, this is the book to read." To all who say our democracy is broken--riven by partisanship, undermined by extremism, corrupted by wealth--history offers hope. Democracy's nineteen cases, honed in David Moss's popular course at Harvard and taught at the Library of Congress, in state capitols, and at hundreds of high schools across the country, take us from Alexander Hamilton's debates in the run up to the Constitutional Convention to Citizens United. Each one presents a pivotal moment in U.S. history and raises questions facing key decision makers at the time: Should the delegates support Madison's proposal for a congressional veto over state laws? Should Lincoln resupply Fort Sumter? Should Florida lawmakers approve or reject the Equal Rights Amendment? Should corporations have a right to free speech? Moss invites us to engage in the passionate debates that are crucial to a healthy society. "Engagingly written, well researched, rich in content and context... Moss believes that fierce political conflicts can be constructive if they are mediated by shared ideals." "Gives us the facts of key controversies in our history--from the adoption of the constitution to Citizens United--and invites readers to decide for themselves... A valuable resource for civic education."